It's hard not to feel a little exasperated, maybe even a little worried, about your plants by mid winter. 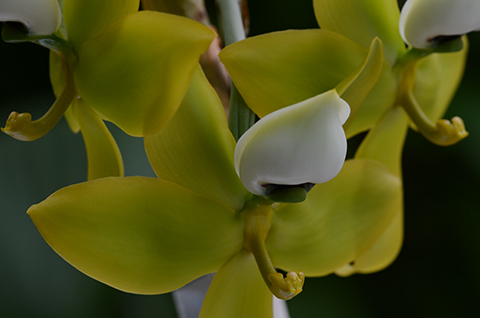 You can't remember the last time you saw a new leaf or new root, let alone a flower spike. C'mon, guys. What do you want from me? Here are some simple things you can do to make them happier. 1. Give your plants more light. If you're like me, and given to whining talking about what must be the darkest winter in recorded history like it's a personal affront, then pity the poor tropical plants that have to endure winter in the north temperate zone. Even in Atlanta (33N latitude) the days are short and the light is feeble compared with a winter day in the tropics. We've been busy washing glass and pulling back shade cloth. You may not have algae on your glass like we do, but what about air pollution, pollen and canine nose smears...? 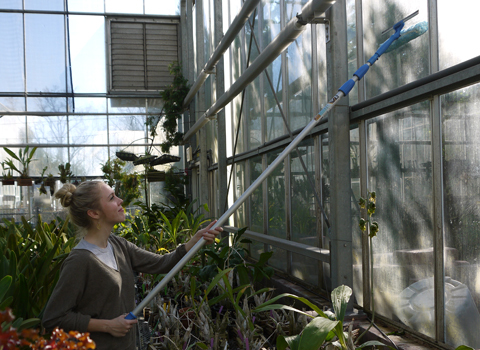 Be sure to move your plants closer to the window, open the curtains and wash the glass. On dark winter days you can definitely get away with dropping the daytime temperature by 5º. Your plants won't even notice. 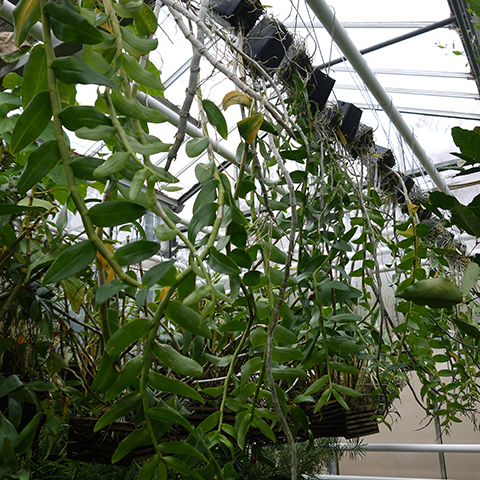 But some orchids, the real sleeping beauties, need some serious rest --a cool dry rest-- in order to set buds. How cool and how dry and how long depends on the orchid. 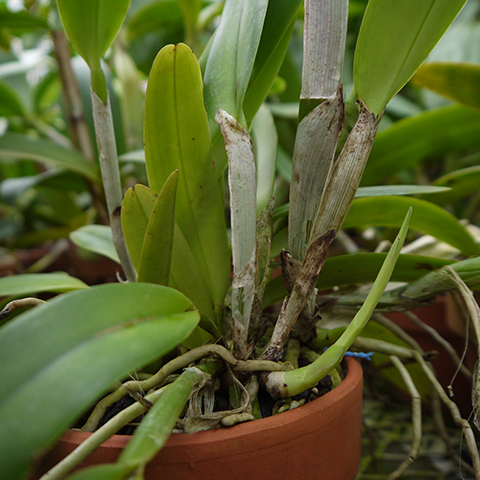 Dendrobium nobile (top), which sheds some of its leaves in winter, wants nighttime temperatures below 57 º for four weeks, and water when almost bone dry. 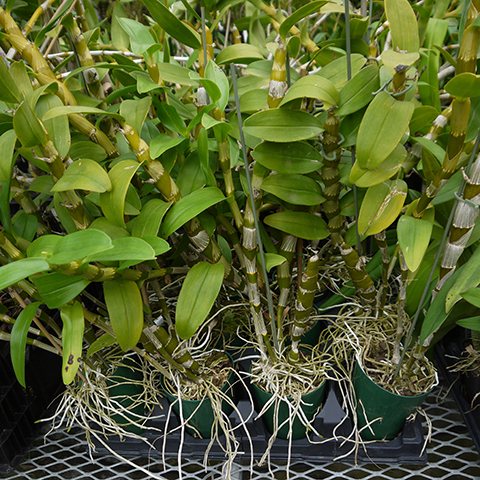 Dendrobium anosmum (middle), which sheds all of its leaves in winter, wants 50-55º and water when bone dry for six weeks. 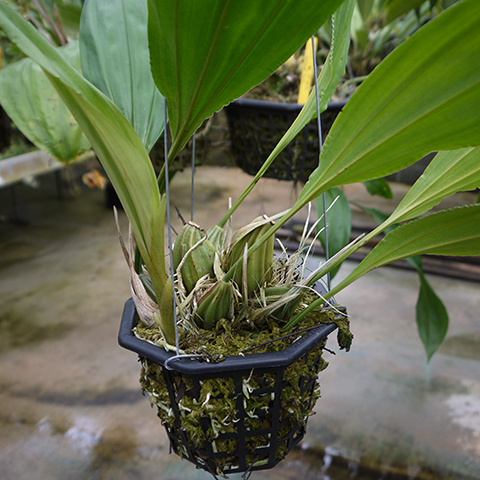 The Catasetinae (Catasetum, Clowesia, Mormodes, Cycnoches) (bottom), want a slight , i.e., 5º drop in temperature, and less frequent watering until the new vegetative (i.e. leafy) shoot is several inches tall. The rest usually lasts four to eight weeks. 3. Don't forget late season repotting. 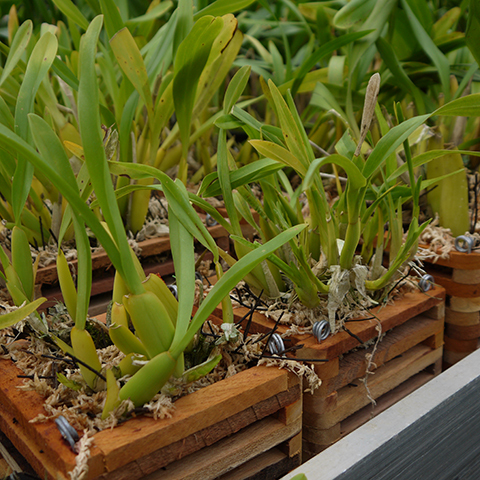 Orchids that flower in late summer --like Cattleya maxima, Miltonia spectabilis and many Stanhopea-- produce new growth in fall and winter. 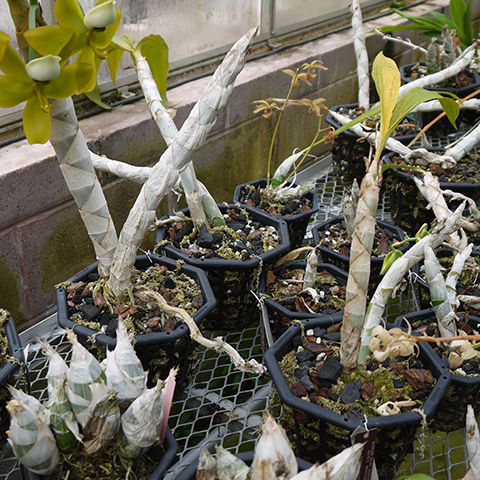 If you forget wait until spring to repot, you will have missed your window of opporunity until next fall, by which time the potting mix will look like soggy Grapenuts and possibly kill your plant. Even though it's winter, keep checking your plants for new shoots, the signal that it's time to repot. Great information! I love the whole plant photos.